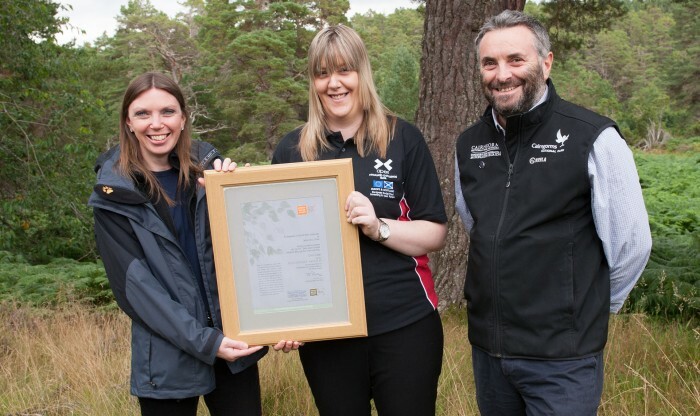 The 25,000th John Muir award to be completed through the Cairngorms National Park Authority was presented today by the Minister for the Environment, Climate Change and Land Reform, Dr Aileen McLeod. Attending a special event at the RSPB Abernethy Nature Reserve, the Minister met with the recipient of the award Ms Grace Moir. The John Muir Award is an environmental award scheme, open to all, that encourages people to connect with, enjoy, and care for wild places. Grace completed the John Muir Award after being referred to Apex Scotland for help with her alcohol addiction. She took part in an outdoor project with Abriachan Forest Trust to improve her health and wellbeing whilst on a 14 week residential programme at Beechwood House in Inverness. Grace has now left Beechwood but she continues to work with Apex and has amassed more than 300 volunteer hours on the outdoor project. She has become a Peer Mentor and now supports other service users while maintaining her sobriety. Peter Pearson, Chairman of the John Muir Trust said “We are proud of our association with the Cairngorms National Park. Reaching the 25,000th John Muir Award milestone through the national park is excellent, but the partnership success goes beyond the numbers of people doing their Award.